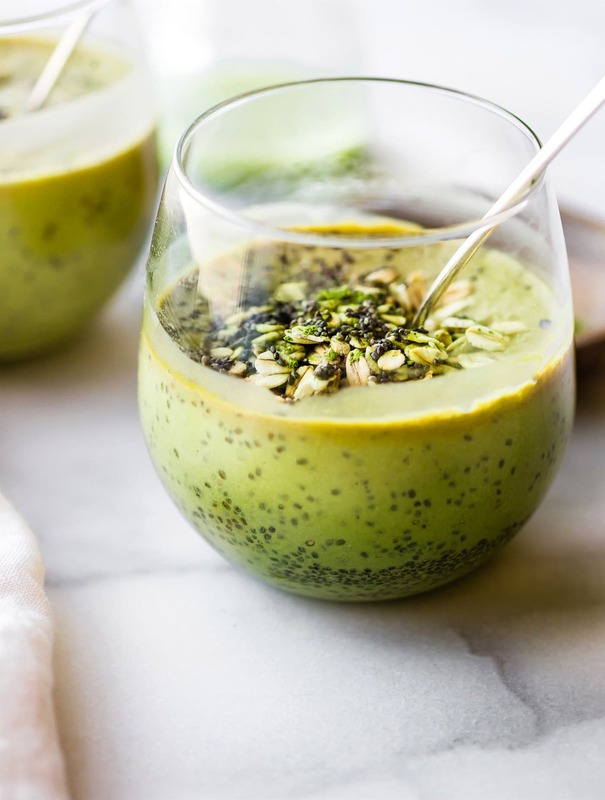 This Chia Matcha Overnight Breakfast Smoothie is a great way to start the day! An energizing, make ahead smoothie packed with antioxidants, fiber, and probiotics! Just blend it up the night before and enjoy the next morning. 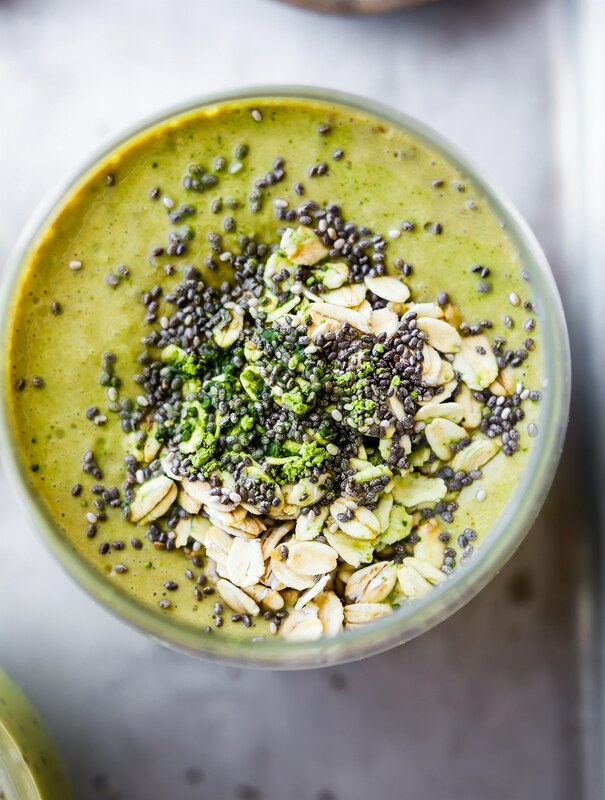 The perfect green smoothie breakfast on the go, or anytime! HAPPY almost GREEN day! As in St. Patricks day! Actually, it’s the day before but you get my point. Time to bust out the Irish Cream, Cabbage, and all the Green Food. 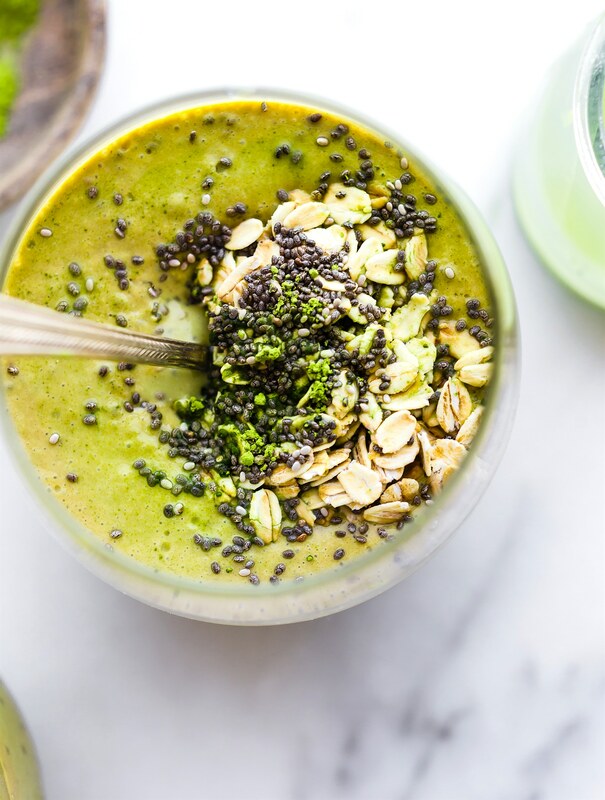 But here’s the thing, since this Chia Matcha Overnight Breakfast Smoothie is an overnight recipe, I figured I better post it a day head. Duh, right? Here’s the other thing. I actually had no intention of making this recipe until I busted out my matcha this week. I then realized I had an AWESOME old matcha smoothie that I could use and probably update. Cause, um, it’s ridiculously old matcha recipe that didn’t even have a plugin. Here’s the third thing… hang with me here. My dilemma. That post? Gosh, it’s all about pre-race triathlon tips and the health perks of matcha. I really had a hard time updating it. It’s kinda like looking back at old photos of your ex boyfriend. You had good memories. The heart ache is still there, but all in all that relationship made you grow. So why throw out or “replace” that photo. In my case, that photo was a memorable walk down my husband’s triathlon career (me as “sherpa wife.”). So here’s what I am going to do. Am doing. I’m going to celebrate that post by reposting the MATCHA health perks and the NEW improved recipe today. Just in time for St. Patrick’s day. St Patrick’s day also reminds me of my Nana. It is her birthday. And you know what she would say? She would quote me Psalm 118:24 and say REJOICE! Celebrate the JOY of TODAY! 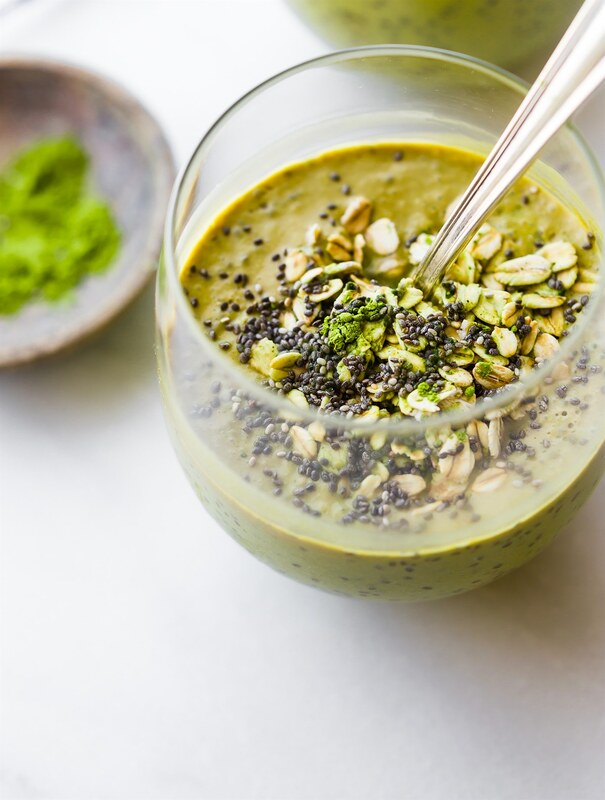 That being said, let’s talks MATCHA and Chia Matcha Overnight Breakfast Smoothie. Mmm k? What is Matcha and Why is so flippin awesome in a breakfast smoothie? Ohh.. you’re gonna love this! Matcha is finely ground powder from a certain type of green tea, usually from Japan. The powder is made and processed when the green tea leaves are shaded from the sun for the last few weeks of their growth. This increases the nutrients and the green color of the tea. Then it’s ground into a powder. Make sense? Provides instant energy without you feeling jittery. Calms and relaxes the brain- Matcha is rich in L-theanine which create alpha waves in the nervous system. These waves produce a so called “relaxed alertness”. I should really add this for my foods that reduce stress meal plan, cause it’s SUPER useful! Rich in vitamin C, selenium, chromium, zinc, and magnesium All my favorite vitamins and minerals! 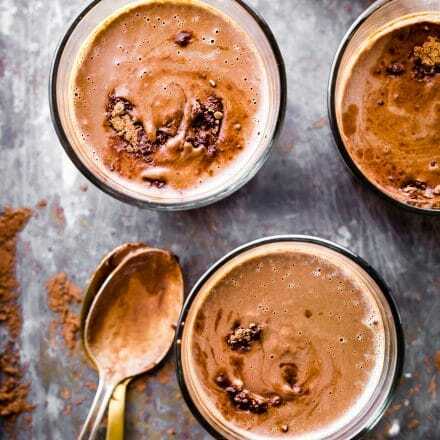 Great in lattes or even just mixed in oatmeal! Matcha is basically it’s the powerhouse of TEA’s! Now that we’ve got the nutrition dialed in, let’s get that overnight smoothie ready! 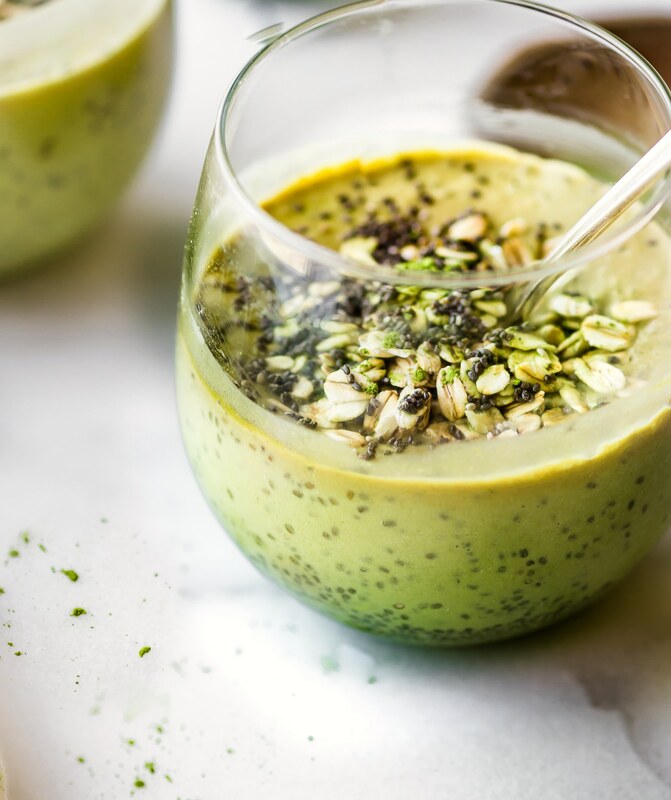 Yes, Matcha can be quite bitter, but I’ve got a remedy for that with this Chia Matcha Overnight Breakfast Smoothie. p.s I added Kefir yogurt to the overnight breakfast smoothie, to make it EXTRA nourishing for your gut. 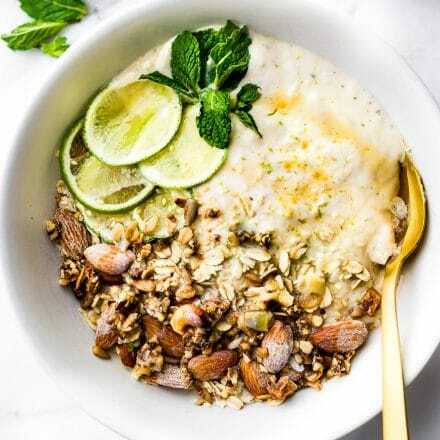 But use coconut yogurt if you’re looking for dairy free or vegan option. Just as tasty! YEAAA! 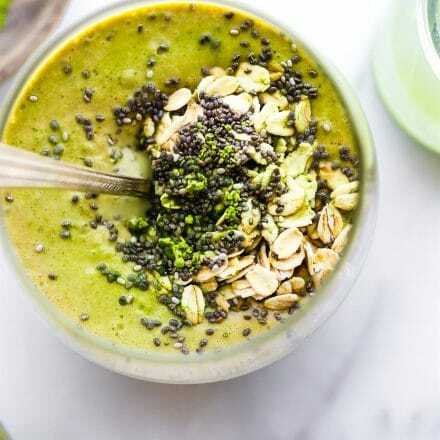 Overnight chia matcha Breakfast smoothie – Energizing Breakfast to go! Gluten Free, Vegan Friendly. Add yogurt/kefir , banana, milk, and protein to a blender and blend until smooth. Add your matcha powder (carefully), and cinnamon. The more matcha you use, the stronger the green tea taste, adjust accordingly. Blend again. Set out 2 bowls or 2 glasses (one large if you want to use if for multiple days). To each bowl or glass, add 2 tbsp of chia seeds. Then add 2-3 tbsp or more of your oats. 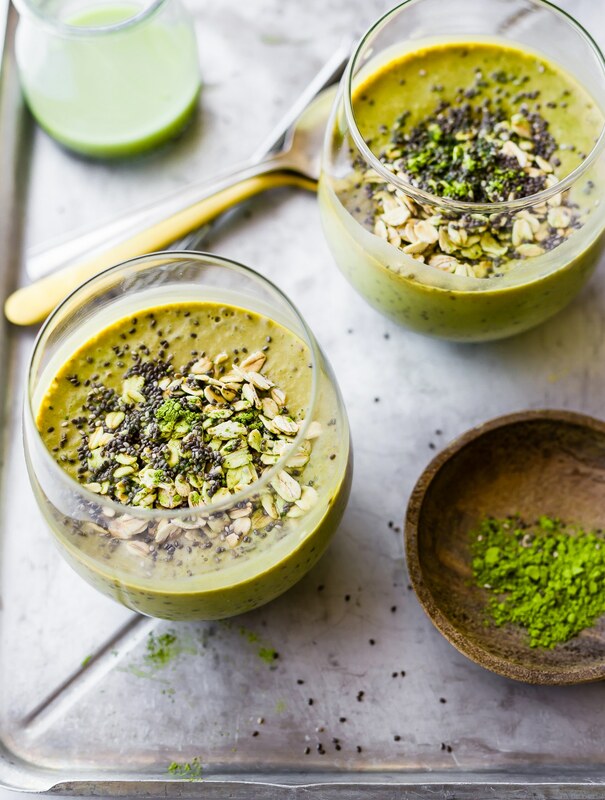 Pour half your matcha smoothie into each bowl or cup. Mix each cup and let it sit overnight in fridge. 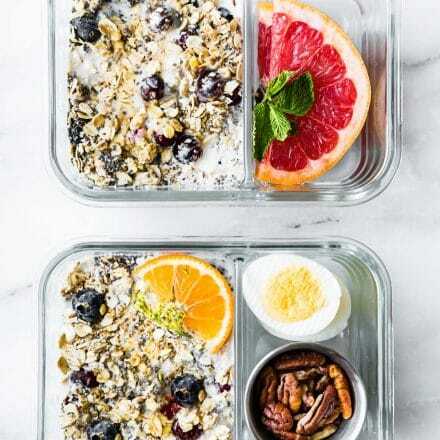 The next morning, top each bowl/cup with extra oats or granola, chia, and maple syrup. I also made a little matcha latte and poured extra on top of that before eating. Here’s the matcha powder bought from Amazon. Nutrition shown per serving, without the additional sweeteners added. What’s your favorite way to use Matcha? Are wearing green tomorrow? I’m just going to carry this drink around all day. Sound good? I know that matcha is so good for you, but it just gets so grassy on my palate. Any tips for easing myself in? yea!!! and happy belated bday! I like this smoothie a lot 🙂 Never bought matcha powder as it is ridiculously dear around here but I like its health benefits so putting it on my shopping list! I like the idea of a breakfast up and running in the AM! Grab and go is a favorite, especially when it sounds this good! Yes, grab and go breakfast is super convenient! Hope you’ll give this one a try! Ah yes, old posts can be so tough to update when they hold so much meaning. This smoothie is eeeverything! I never thought of making an overnight smoothie, and am in love with the concept. Plus, matcha? Need the antioxidants asap, please! isn’t it? old posts make me laugh and cry. haha! Thanks Julia! This is the best way to start the day, nice and healthy and I adore that color! What a healthy dish! I love this ingredients combo. Looks so good. So much to love for sure! Thanks Brandi! These are beautiful!! I have to make this!! Let me know if you do! Thanks! yea! let me know if you try it Jordan! OH no wonder I love you so much! Drink green beer for me! mine too! I bet you’d love Casey! I was so good about matcha for the longest time. I need to get back on it! This looks like breakfast tomorrow. Lucky green! The only green I’ll be wearing is this smoothie – that is if it splashed on me as I slurped it! 🙂 Matcha is so good – and I usually enjoy it in pancakes or waffles – but I gotta diversify and give this a try – GORGEOUS photos, Lindsay! Happy Green FriYAY!!! oh i love your green pancakes! ps. I almost did not recognize you! NEW NAME! These are so pretty! great shots….love this whole idea! Would it be possible to make this without the yogurt? I am dairy free and do not know if my local grocer has coconut milk yogurt. I think so. I’m wondering if you could maybe use coconut cream, chilled to thicken it a bit instead of coconut yogurt. If not, try just 14 ounces almond or coconut milk and add extra banana or chia to thicken. Keep me posted! Hi! This looks perfect for the work week. Do you think I could double the recipe and make 4 days supply? Would it keep in the fridge that long or am I pushing it? I think so! You might need a little more milk though. Keep me posted! If you don’t like bananas, what would you recommend as an alternative? Thanks!